Old network in southern Auckland, almost all infrequent. Can you see how to get anywhere? The new network emphasizes all-day high-frequency services, connecting to each other in grid patterns and to newly frequent rail lines. Read about that big picture, and its payoffs, here. A small piece of the network, in the Green Bay area, was implemented last year, and achieved a 20% ridership increase (on no increase in service quantity) in the first year. Now, the first really big piece has been rolled out across southern Auckland. This area, formerly the City of Manukau, is relatively low-income, ethnically diverse, and features fragmentary, shredded street patterns that are a huge challenge to network designers. A fragment of the old network is above. Virtually none of it, including the train line, was frequent. 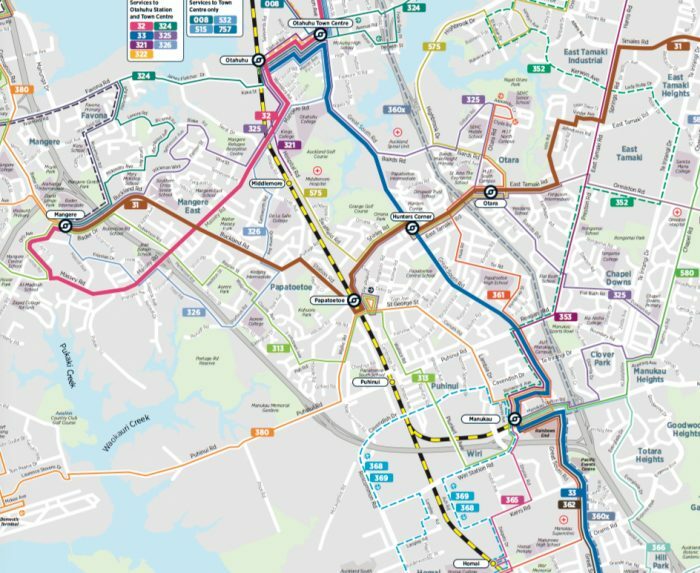 The overlapping lines with uncountable 3-digit-route numbers show local routes tangled up in express routes going all the way into the CBD far to the north, competing with the rail line. Why the huge reduction in complexity? Virtually all express buses to the CBD were replaced by buses connecting to the main rail line, which is now frequent. Local lines were organized so that they form a logical network feeding into local hubs as well as to major rail stations. Note that not all rail stations are bus hubs; the network concentrates only on certain rail stations so that buses connect with each other as well as with the trains, and so that consolidated station facilities can be built at these locations. The biggest new hub, Otahuhu at the north end of South Auckland, has a huge number of buses feeding it, and got a shiny new bus-rail station for the new network’s opening day. As always, there will be hiccups in the implementation process, as people adjust. But it’s great to see this plan, first sketched four years ago, on the street at last. It looks great. If only other cities such as Brisbane, Sydney, Melbourne, and Adelaide followed suit. Coordination within a public transport network is really important. Sadly when light rail was discussed for Hobart, we had a transport planner talking about competition between buses and light rail. Surely this is completely backwards! It’s all mass transit, get organised! Like in Auckland, a ‘spine’ of frequent rail service, joined with bus networks that loop around and feed into stations, would offer a valuable alternative to traffic congestion. And an alternative to the ridiculous amount of money spent on the Elwick roundabout too. 1: It does not focus on the ill conceived notion that a place has to pick between coverage and ridership. Instead, transit service is still provided to all the urbanized portions of the region, with the expectation that some riders may have to walk slightly further to access a bus stop. But it does not tell whole neighborhoods they are not worthy of transit, like many other cities have done. 2: While evening service could be improved, the plan does strive to provide an attractive base service on all routes. Meaning good base service, supplemented by a good high frequency network. Great work they are doing in Auckland. Thanks for the article Jarrett! The new networ is looking like a massive improvement for all of the non-CBD 9-5 commute trips. Can’t wait to move back (admittedly to North Auckland in a couple of years once that part is finished. 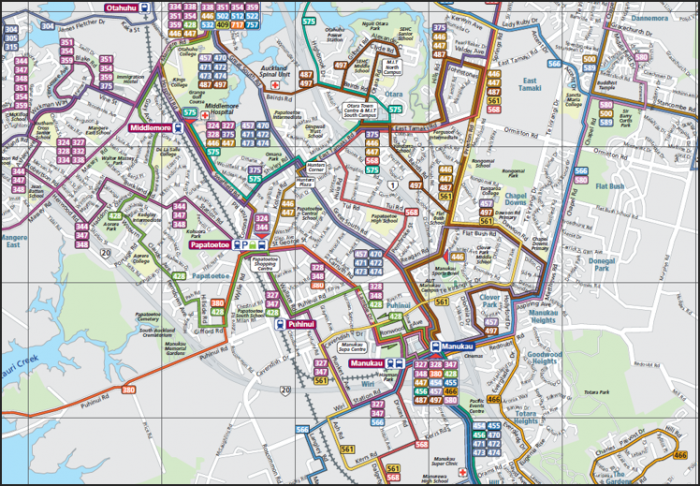 Seriously, the old routes were designed by *private competing bus companies*? That explains why it was such a dog’s breakfast.